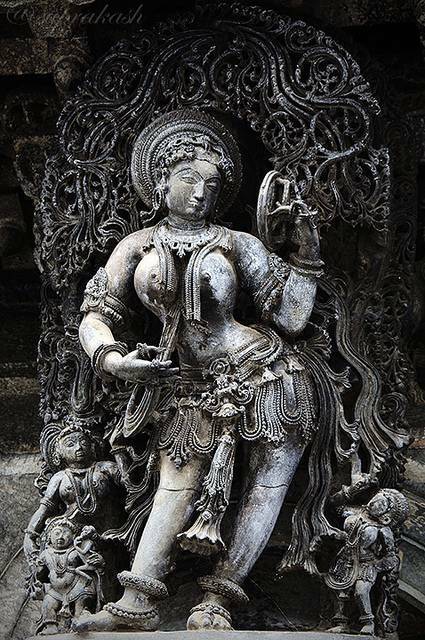 Darpan Sundari, or The Lady With the Mirror, is one of the must-sees sculptures inside the Chennakeshava Temple. A sculpture found within the interior walls, there’s something sublime about the way she stands; hand on hip, mirror in hand. There are a number of other figures of celestial nymphs or Madanikas. All of these figures are said to be inspired by the mesmerizing beauty of Shantala Devi, Queen of King Vishnuvardhana.